On September 27, 2016, Dra. 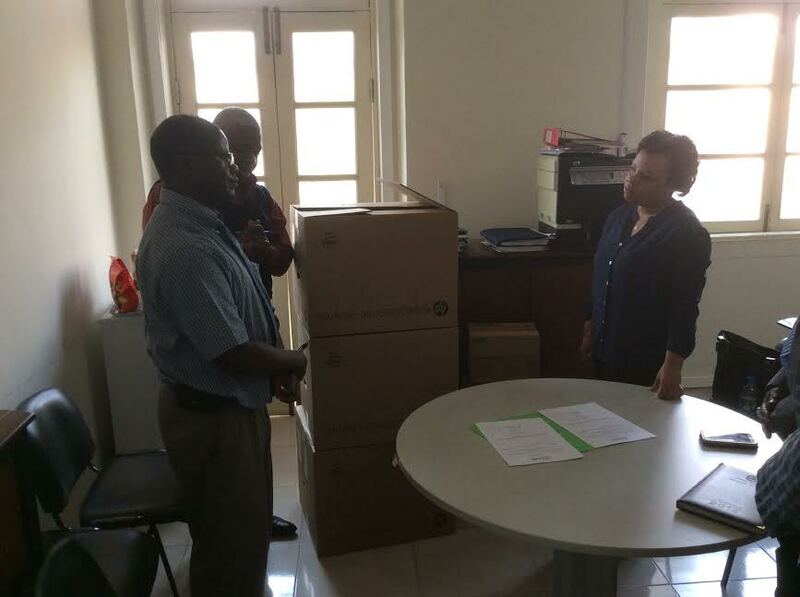 Katiza Mangueira, the Head of the Angola Ministry of Health’s Directorate of Medicines and Equipment (Direcção Nacional de Medicamentos e Equipamentos [DNME]) accepted three desktop computers and power surge adaptors from the Angola office of the Systems for Improved Access to Pharmaceuticals Services (SIAPS) Program. Dra. Mangueira accepted the equipment on behalf of the newly established DNME Medicines Regulatory Unit. The PCs were procured as part of SIAPS’ ongoing support to strengthen the DNME Unit. The ceremony was held in the Medicines Registration Unit office in Maianga, Luanda, and was also attended by Dr. Constancio Joao, Head of the DNME Unit; Dr. Pombal Mayembe, former head of the Department of Medicines and Sanitary Products of the DNME; and other DNME staff. SIAPS was represented by Dr. Wonder Goredema, SIAPS Angola Acting Country Project Director and Technical Strategy Lead; Martin Iputu, Finance and Operations Director; and Lubaki Joao, Technical Advisor. The SIAPS Program is funded by the US Agency for International Development. In handing over the equipment, Dr. Goredema thanked the DNME for the continuous support and collaboration that SIAPS and its predecessor programs have enjoyed over the years. He noted that SIAPS had previously supported the DNME in its efforts to become a semi-autonomous institution with greater authority to regulate medicines and in advocating for the necessary policy approval to become semiautonomous. The program also assisted the DNME in building the institutional and staff capacities of the Medicines Regulatory Unit and in developing a web-based database to identify and list medicines that have been imported in the last three years as a starting point for the national medicine registration process. The program donated the three PCs to the DNME to use for registering medicines. Moving forward, SIAPS will explore with the DNME on how best to disseminate a new SIAPS technical report on introducing a medicines regulatory policy in Angola. They will also advocate with the DNME to collaborate with key local stakeholders to implement the recommended roadmap for establishing a product registration system in Angola. Dr. Goredema expressed hope that the equipment would last long and go a long way in strengthening medicines registration in Angola, thereby contributing to uninterrupted access to safe and quality medicines for the Angolan people. In accepting the equipment, Dra. Mangueira expressed her appreciation for the computers, noting that they would be useful in setting up the registration system. She noted that the donation was testimony to the long collaboration between the DNME and SIAPS. Dr. João acknowledged SIAPS support and expressed hope that the DNME would continue to enjoy such support with follow-on projects in the future.